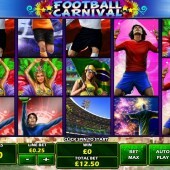 Football Carnival is online slot developer Playtech’s football-themed slot release in the run-up to the World Cup. This 5-reel, 50-payline slot has all the ingredients of a game that is going to prove very popular with men around the globe. There are carnival dancers, football players and images synonymous with Brazil itself as the symbols. Even the reels are set against a backdrop of the Rio de Janeiro coastline with the Copacabana beach in all its glory. I should state that the football players who come in four different colors are all stacked on the reels increasing the potential of hitting some winning combinations with regular symbols. Even the Wild Has Gone Brazilian! The Wild symbol is represented by the yellow and green football. It substitutes for all other symbols, except for the Scatters, to complete winning combinations and hand out some potential big cash wins. 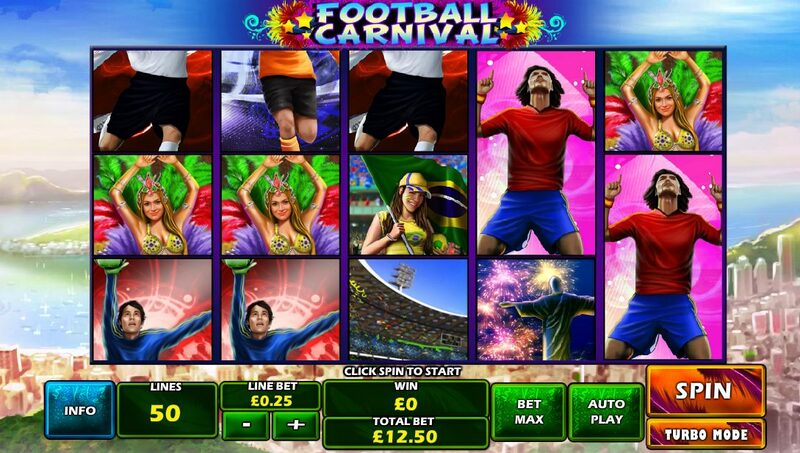 There is a free spins bonus round on this slot that is triggered by hitting three or more of the Football Carnival Logo Scatters across the reels. If triggered, you will immediately be rewarded with 10 free spins. You will also be awarded a basic multiplier of 2x but this will increase by a value of 1 after every 2 free spins. This means that at the end of the free spins you will be earning a 6x multiplier on your free spin payouts. There will also be an Extra Wild present on the reels during the free spins bonus round so even though the 10 free spins does not appear to be much, especially when they cannot be re-triggered, you will have multipliers and Extra Wilds thrown into the mix to keep the action lively. Football Carnival does not break any new ground and I feel it is simply Playtech getting on the World Cup bandwagon. It’s not a terrible slot but in my opinion Microgaming’s quality slot Football Star is a much more exciting and creative slot. There is also Playtech’s very own Top Trumps Football Legends if you want a more thrilling football-themed slot. This year was craving a top notch World Cup-themed slot - this wasn't quite it.